Transdev Blazefield has invested £3m in 20 new Optare Versas for Rosso’s 464 service, which links Accrington, Haslingden, Rawtenstall, Bacup and Rochdale. Exterior-wise, the buses feature illuminated ‘464’ logos to make them immediately recognisable at night, as well as a specially-designed livery featuring local people going to work, school or the shops. Free WiFi, USB power at every seat, wireless charging for mobile devices and skylights are all equipped inside. 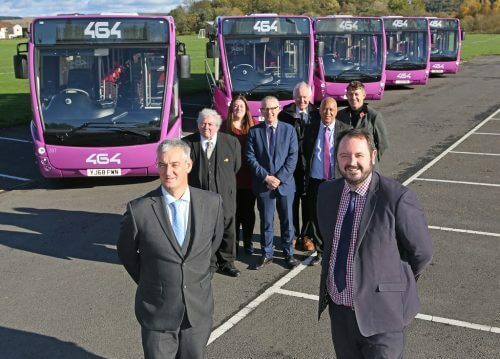 Transdev CEO Alex Hornby said: “When Rosso joined the Transdev family at the start of 2018, we promised an immediate investment in brand new, high spec vehicles in our first year, and here we are doing it on a new look 464 which is the lifeline bus route for Rossendale, connecting people to work, school and leisure opportunities. “Our track record in Lancashire and across the North is all about growth and innovation to attract more people to discover the benefits of choosing the bus, freeing up our towns of congestion with lower emission solutions.